EL PROGRESO, Honduras, Sep 18 2014 (IPS) - United by grief and anxiety, the grandmothers, mothers and other relatives of people who disappeared on the migration route to the United States formed a committee in this city in northern Honduras to search for their missing loved ones. 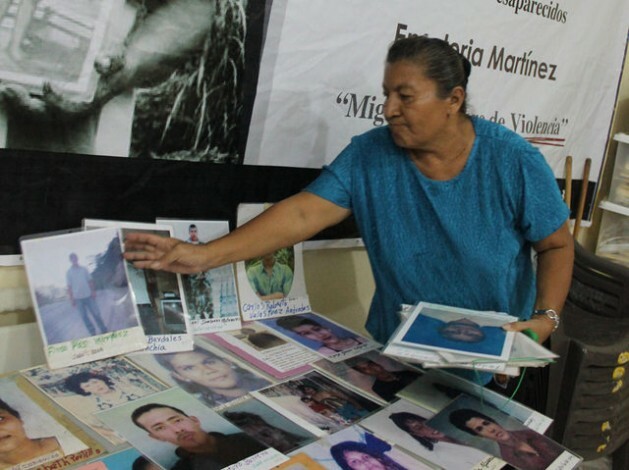 Founded in 1999, the Comité de Familiares de Migrantes Desaparecidos de El Progreso (COFAMIPRO – El Progreso Committee for Disappeared Migrant Relatives) is now one of the most highly regarded migrants’ rights organisations in Honduras. For the past 14 years, COFAMIPRO has aired a radio programme on Sunday afternoons called “Abriendo Fronteras” (Opening Borders) on Radio Progreso, a station run by the Society of Jesus (a Catholic religious order) in Honduras. The hour-long radio programme fulfills a vital social function. It advises migrants about conditions on the routes, plays the music they request to lift their spirits, and provides a sevice by enabling them to send messages to their relatives in Honduras. Emeteria Martínez, a founding member of COFIMAPRO, died in 2013 just months after locating one of her daughters , who had been missing for 21 years. Finding their family members was the driving force that united them, Santos said. “The group was created out of nothing, by discovering that one woman’s grief was the same as another’s. We would meet in the home of one of the group and that’s how we built up courage to go out into the world and search for our relatives,” she said. Twenty women started the group, and now the leadership group is composed of more than 40 members. They are unassuming women but they are buoyed by hope, in spite of the pain of not knowing anything about their missing relatives and of facing dreadful tragedies like the Tamaulipas massacre in Mexico. Four years ago, 72 migrants, 21 of whom were Hondurans, were shot at point-blank range by Los Zetas, a Mexican criminal cartel. Their bodies were found on a ranch in the San Fernando district. The Tamaulipas massacre brought home to Hondurans the suffering involved in migration, over and above the issue of the remittances sent back by those who make it to the United States. “It was like a defeat for us. You hope that your son or daughter will travel safely on the migrant route and manage to cross the border, but you do not expect him or her to be massacred and shipped back to you in a box. That is really shocking,” said Santos, who together with other members of COFAMIPRO has helped and comforted victims’ relatives. The women on the Committee are all volunteers who have overcome their fear of the unknown. For over a decade they have taken part in the mothers’ caravans , motorcades organised by the Movimiento Migrante Mesoamericano (Mesoamerican Migrant Movement), which in September every year travel the migrant routes, looking for clues to the whereabouts of missing relatives. The migratory route begins in Guatemala and ends at Mexico’s northern border. “The first time I went on the caravan, three years ago, I understood the importance of my mother’s work. I learned from her grief and I decided to take a full part in the Committee,” Marcia Martínez, 44, another daughter of the Committee’s deceased founder, told IPS. “I had no idea of the huge number of mothers and relatives who join the motorcade, nor of the epic nature of the journeys my mother undertook. They cover all the routes used by the migrants, asking about them with placards, looking for answers that sometimes never arrive, or arrive too late. When we find someone we were looking for, the joy is indescribable,” she said. “Every time I heard the rumble of The Beast [the Mexican freight train ridden by migrants on their way north] I would shudder because that’s where I discovered how dangerous the migrant route is. For them, the train tracks are their pillow. They sleep on the tracks and when they get on to the roof of the train they wait for it to get going, but some fall asleep from exhaustion and fall off when it moves,” Martínez said. COFAMIPRO’s premises are in a shopping centre in El Progreso, one of Honduras’s five largest cities, in the northern department (province) of Yoro, 242 kilometres from Tegucigalpa. Formerly they were housed in Jesuit property, but thanks to donations they were able to rent their own small locale where people can come for support to find their relatives. In the years since it was founded it has documented more than 600 cases of disappeared persons, of whom over 150 have been found. They continue to seek the rest, although they believe that many must have died on the way or fallen in the hands of human trafficking networks. Initially the government would not recognise the Committee, but the success of its work with the Mesoamerican caravans led to its voice being heard. It has presented cases of disappeared migrants to the foreign ministry. In June, the group finally acquired formal legal status. Their struggle has not been easy. Honduran officials dismissed them as “crazy old women” when, years ago, they organised their own march to Tegucigalpa to demand action for their missing loved ones. Their steady, silent work has yielded fruit. When IPS interviewed a group of these women, they had just saved the life of a Honduran man, a relative of a local official in El Progreso, through their Mexican contacts. He had been kidnapped by a criminal organisation that extorted more than 3,000 dollars from his family before they approached the Committee, which secured his release through an operation by the Mexican prosecution service. Five years ago, COFAMIPRO issued a warning about the present migration crisis, but no one listened. According to the group, migrants will continue to flee from unemployment and criminal violence. In the baking hot city of El Progreso, cases have been known of mothers who left town when criminal gangs told them their children would be forcibly recruited into the criminal organisations when they were old enough, and that in the meantime the gangs would provide money to raise the children and pay for their education. An estimated one million Hondurans have emigrated to the United States since the 1970s, but the exodus has intensified since 1998. As of April 2014, Washington has intensified its deportations of families with children as well as adults. The Honduran authorities say that 56,000 people were deported back to the country in the first seven months of this year. Of these, 29,000 arrived from the United States by air and 27,000 from Mexico by land. Honduras has a population of 8.4 million and a homicide rate of 79 per 100,000 population, according to official figures. In 2013, migrants contributed 3.2 billion dollars to the Honduran economy in remittances, close to 15 percent of GDP, according to the Central Bank. In COFAMIPRO’s view, the migratory crisis should spur governments to reform their public policies and refrain from stigmatising and criminalising migrants, because “they are not criminals, they are international workers,” Santos said. She, at least, has the consolation of having found her missing nephew four years ago.